Somewhere, Godzilla is shaking his head and lamenting the genre that he spawned. 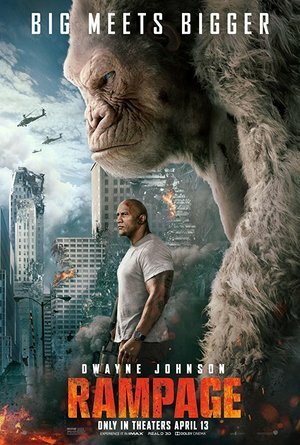 Watching Rampage, the new monster adventure debacle from director Brad Peyton, is like being trapped in a movie about a giant gorilla brainstorming session with two 14-year-old boys. It's admittedly hilarious, but in an "I've been up studying for 36 hours straight and I'm starting to lose my tenuous grip on reality" sort of way. As the stupidity flows over you, the only rational response is to laugh and hope that your brain disengages before it suffers irreparable damage. For all of the questionable roles he has taken while climbing atop the Hollywood hierarchy, Dwayne Johnson (forever 'The Rock' to people of a certain age), remains thoroughly believable in everything he does. He engenders genuine empathy as you're swept away by his sincerity, surprisingly quick wit, and his impossibly large muscles. Truly, Johnson is well beyond beef cake at this juncture; he's reached levels of beef buffet. So even when he's masquerading as a primatologist at the San Diego Zoo, you're willing to suspend disbelief and trust that he can ease your cinematic suffering. Here, he plays Davis Okoye, a dedicated animal lover who once served in Army Special Forces before taking up arms in an anti-poaching task force. He lost faith in humanity when he witnessed the parents of his albino gorilla buddy George slaughtered for their paws. Now out of harms way, George hams it up at the zoo, occasionally exchanging fist bumps with Davis and pranking interns with his 'gorilla run amok' routine. Everything really does goes amok when debris from a scientific space station rains genetic pathogen onto unsuspecting critters. A curious George is infected, as are a gray wolf and a crocodile that helped themselves to a meal of mutated genes. Overnight, they are transformed by lethal levels of growth hormone into rampaging monsters that are impervious to every weapon devised by Man. Poor George escapes his enclosure and heads for Chicago, where a mysterious radio signal atop the Willis Tower beckons the monsters to meet for an ultra-destructive showdown. It's impossible to convey the stupidity on display in Rampage. Loosely based on a video game series, it stumbles from one action set piece to the next, spouting some of the most groan-worthy dialogue to ever escape a screenwriter's tortured brain. When Davis tangles with a government agent (Jeffrey Dean Morgan as 'Agent Russell) tasked with retrieving George, the agent informs him, "When science shits the bed, I'm the one who changes the sheets." That Morgan makes this terrible line sound almost convincing should probably garner Oscar consideration. The idiocy starts immediately, in a pre-title sequence that features a giant lab rat chasing an astronaut through a derelict space station. A cartoonish severed hand floats through the frame as the monster ping-pongs toward the camera; a blur of fur and gnashing teeth. It's a cheesy indicator of what's to come and hints that, for those with a high tolerance for premium schlock, we're in for some righteous trash. For everyone else, Rampage will be only fitfully entertaining. Peyton, who previously collaborated with Johnson on the turgid 2015 disaster film, San Andreas, seems to struggle with getting his actors on the same schlock meter. While Johnson and his foxy scientist sidekick, Naomie Harris (as 'Dr. Kate Caldwell'), play things perfectly straight, Morgan and the film's primary villains (a brother and sister team of mad scientists played by Malin Akerman and Jake Lacy) enjoy an extra-large plate of ham with a side of bacon. Morgan steals every scene with his Southern drawl and seen-it-all smugness. It's as if Tommy Lee Jones' iconic character from The Fugitive suffered a concussion and refused all medical treatment. Morgan stumbles around making bizarre decisions and equally bizarre pronouncements like, "My daddy used to say that assholes gotta to stick together." Of course, not every performance can be as over-the-top as Morgan's, but a little more self-awareness from the cast might have prevented the fun from abandoning this creaky plot. Genetically "edited" animals militarized for nefarious purposes. What the scientists from Rampage hope to accomplish by splicing wolf DNA with that of a flying squirrel is beyond comprehension, but it's got to be more interesting than what Peyton actually filmed. Even better, why not bring together every movie villain that wants to weaponize biological life forms and see who wins? Smart money is on the corporation from Aliens, but Dr. Evil might be a contender if he ever gets that frickin' laser beam on the shark's head. The special effects, particularly the aerial shots of monsters careening through the Chicago cityscape, are laughably bad. We haven't seen effects this cornball since the dude from Beverly Hills, 90210 battled a piranhaconda. (Ian Ziering has never actually battled a prianhaconda, but it would be sublime if he did.) Worse still, when the monster Battle Royale finally arrives, the story is too fixated on the fate of the humans to relinquish center stage to monster carnage. Rampage is second only to Pacific Rim Uprising when it comes to promising an epic monster fight that it never delivers. Somewhere, Godzilla is shaking his head and lamenting the genre that he spawned. 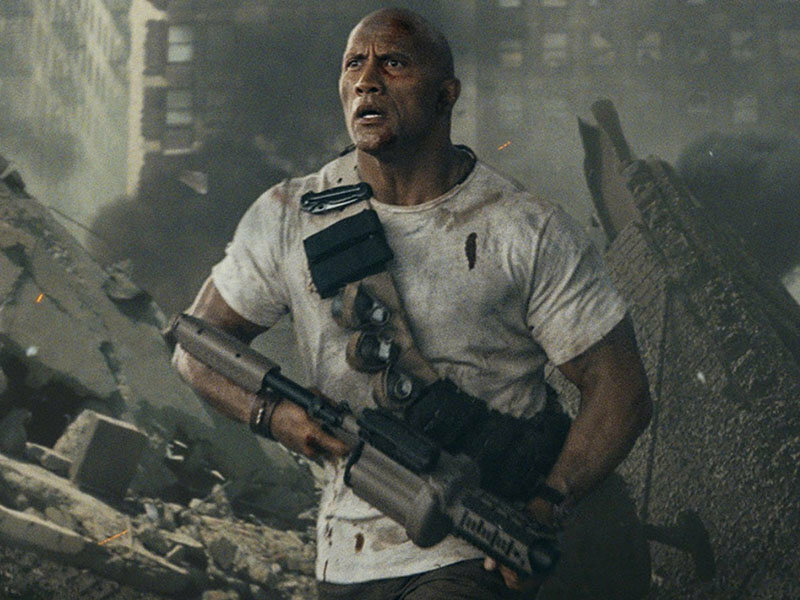 Despite its flaws, it's hard to get too angry at Rampage. Its greatest offense is being dumb (not exactly a rare commodity at the Cineplex) and there is undeniable entertainment value for lovers of schlock. That it should have been a made-for-television movie with D-list actors makes it all the more fascinating. How did this movie secure a major theatrical release? Is the Rock so bulletproof that he can buoy even this piece of cinematic bolus? If 14-year-old boys have anything to say about it, yes.